North Campus Open Space, seen here before UC Santa Barbara broke ground on its ecological restoration of the former Ocean Meadows Golf Course, is being restored to its natural wetland state. When restoration is complete, the North Campus Open Space will encompass 136 acres of coastal habitat. 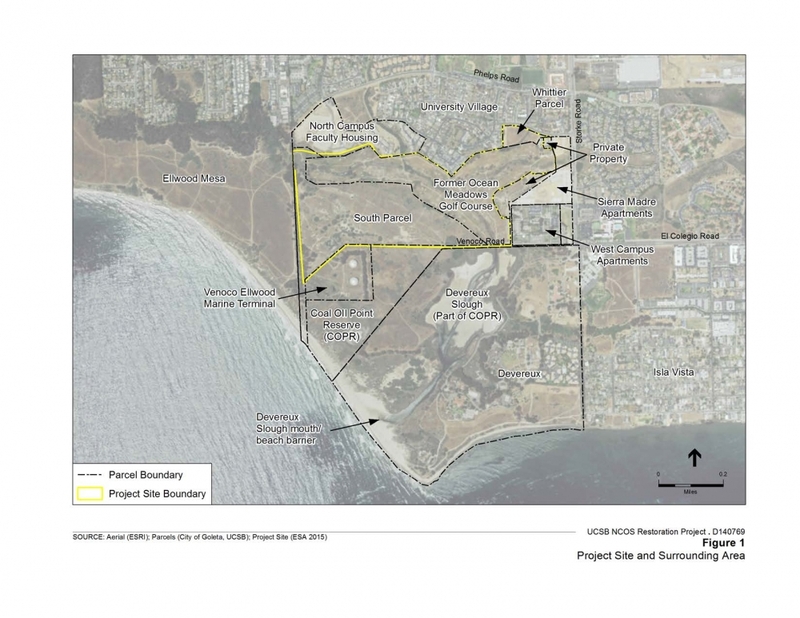 Four years after receiving the property as a gift from a nonprofit, UC Santa Barbara has officially begun its planned ecological restoration of a former golf course in Goleta. 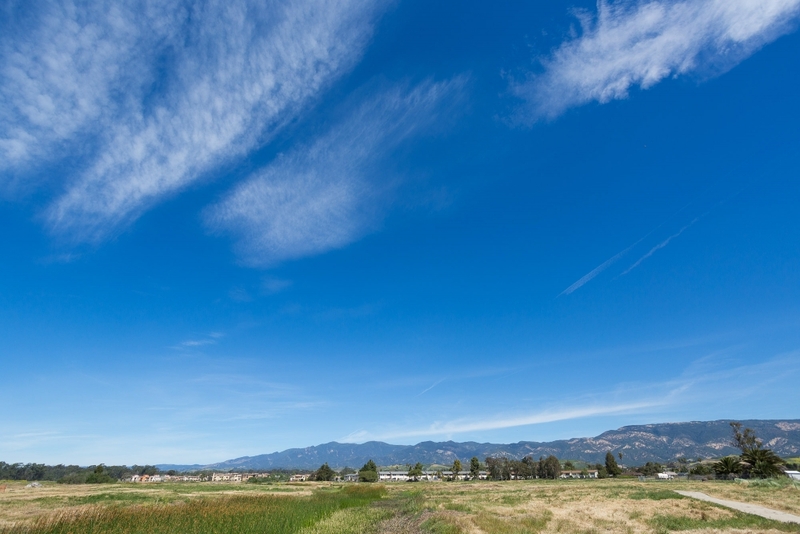 With the support of a diverse array of public agencies, UCSB is working to revive and preserve wetlands on the upper Devereux Slough, which some 50 years ago was filled with soil to make way for Ocean Meadows Golf Course. With the integration of adjacent uplands, the 136-acre parcel now known as North Campus Open Space (NCOS) will ultimately open to the public, coastal habitat and trails extending three miles along the Ellwood Devereux coast by connecting several existing preserved properties. “UC Santa Barbara cherishes the opportunity to partner as a long-term steward of this open space, and we are excited that we have now broken ground on a project that will restore and preserve these precious wetlands for public access, research and teaching,” said Chancellor Henry T. Yang. With cooperation from multiple departments and divisions at UCSB, and in continued collaboration with several outside partners, the project from day one has been developed with the community in mind — and involved. A series of open meetings, held over three years, was meant to elicit broad input, foster discussion of the evolving plans and engage the public in the process. Further, in keeping with a longstanding commitment when it comes to open spaces, UCSB is integrating its research and education mission into the design and management of the project. Already several academic courses, class projects and independent student efforts have centered on research opportunities at the site, including public use, insect diversity, soil and water quality, carbon sequestration and sea level rise. “California has lost over 90 percent of its wetlands due to development over the last century and half, yet these lands serve an important ecological function in the state,” said John Melack, chair of both the NCOS Project Committee and its Science Advisory Board. “What occurred here — a landowner was allowed to completely fill in a wetland to build a golf course — would not meet modern standards of land use. We now have this opportunity to restore the property, to double the size of a coastal wetland and bring to bear the functions wetlands provide in terms of hydrological control, to better accommodate floods and sea level rise, to facilitate recovery of species and to support species that are already in abundance. The project has only upsides when it comes to ecological benefits. Sitting north of the UCSB-owned and operated Coal Oil Point Reserve, the open space connects a string of protected lands along the gateway to the Gaviota Coast. Its restoration will see it become part of a 650-acre expanse of coastal habitats now being preserved, and opened for public access, in perpetuity. Culminating a years-long effort, the Trust for Public Land (TPL) in 2013 purchased 63 acres of the golf course with $7 million in grant money and subsequently gifted the property to UCSB to serve as long-term stewards of the land. TPL has remained a key collaborator, partnering with the campus on community meetings and public access design concepts. The project has wide public support at regional, state and federal levels. To date, UCSB has secured grants totaling more than $15 million to help restore the estuarine and adjacent mesa ecosystem. Among the largest funders of the endeavor is the U.S. Fish and Wildlife Service (USFWS), which has committed more than $3 million. The USFWS Endangered Species Recovery Land Acquisition Program granted the State of California $500,000 toward acquisition of the property. An additional $3 million in matching funds from the service’s National Coastal Wetlands Conservation Grants Program was awarded to assist with land acquisition as well as planning, design and the restoration itself. Major funders on the state level include the Wildlife Conservation Board, CalTrans, California Department of Fish and Wildlife, the State Coastal Conservancy, Department of Water Resources Urban Streams program, California Natural Resources Agency and the Ocean Protection Council. Financial support from Santa Barbara County Flood Control and the collaboration of the Land Trust for Santa Barbara County, the City of Santa Barbara, Goleta West Sanitary District, Associated Students of UCSB Coastal Fund and others have been equally key to the project. The grants themselves are diverse in focus, ranging from flood control and sea level rise benefits, to greenhouse-gas sequestration and wetland and endangered species habitat support, to non-vehicular transportation alternatives. Permits and construction funding were secured in December 2016. A public bid process was conducted for the major earthwork. Four M Contracting, specialists in habitat creation projects, hope to move nearly 350,000 cubic yards of soil out of the former estuary by November. The planned 1.2 miles of trail and four crossing structures will be constructed in parallel to reduce the amount of time the project site is fenced. “North Campus Open Space will become part of what is, overall, an extraordinary resource for the campus and the whole community, and for the environment,” said Joel Michaelsen, a professor emeritus and former executive vice chancellor at UCSB, and a principal investigator on the grants for the project. “You take that piece of property, plus what we call the South Parcel, the Ellwood-Devereux preserve and our Coal Oil Point Reserve and all of that together will create an incredible open space that you just don’t find very much of on this part of the coast anymore. With its characteristically large pectoral fins, big pouty mouth, and near-translucent appearance, the tidewater goby is a distinctive fish. A $1 million grant will help re-green part of a former golf course turned public open space.